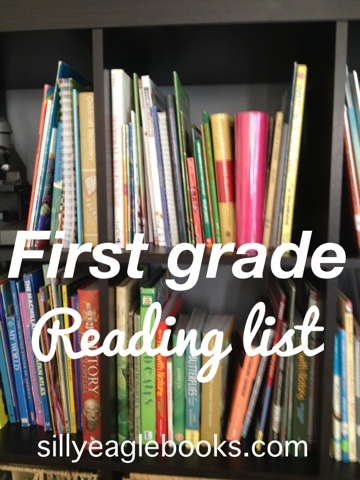 It is our habit to go the library and check out about 30 books a week just for our personal reading pleasure, but this year, I thought it would be good to make a list and try to go through it. Not because we don’t read enough, but just to give us a bit of a guide.Guidance may be about anything and everything. It may be on setting up the biological rhythm of your baby or the quick ideas to make your kid learn alphabets, numbers, and colors easily. I have even come across books which were a practical guide to start to earn early and safely, which also included a comprehensive review of such reliable options. At the end of the year, it will be fun to look back and see all that we have read together, to talk about favorites and which new authors we had discovered. I found these books in Some of My Best Friends Are Books: Guiding Gifted Readers and thought they sounded fantastic. I have not read any of the ones listed here, though there were some that we have already read and loved. There are lists for preschool, 3-4 year olds, upper elementary, middle school and high school as well. The book also gives descriptions and insights as to plot and why these are good choices for children to read on their own or together with a parent. 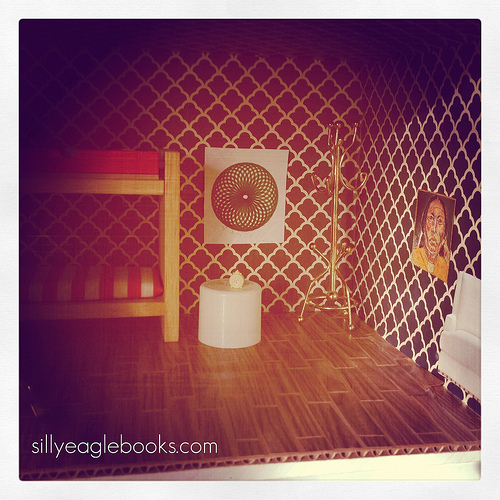 If you read this blog, you probably don’t need to be convinced of the importance of reading or books, but I enjoyed reading Some of My Best Friends Are Books because it just reinforces what I already knew and gave me some great ideas for more books for us to explore as a family. Maybe you can read along with us or tell us about any of the books you’ve read already? I am keeping my fingers crossed that our library has most of these. It not, I’ll be scouring thrift stores and hunting them down on amazon. Stay tuned for part II of this list! We’ve been keeping a list of the birds we’ve seen in our backyard this winter and decided it would be fun to do an egg identification project. We cut out eggs from water color paper and spent an afternoon researching the different eggs an then attempting to paint them. After they dried, we mounted them on some black construction paper and labeled them. These were then placed in Juliet’s bird notebook. This is not all of the eggs, but you get the idea. I think our favorite part was painting the eggs. We used Birds, Nests and Eggs and the internet to get images of the eggs we were looking for.Not all the eggs were different from each other. Some eggs differed from each other in colors and patterns whereas some differed in their sizes. Certain birds had nests strikingly distinguishable that in a second-long glance we can identify the species. At times, we had difficulty in taking the real-life images of the eggs since the birds were not all leaving the nests, we can be blamed for the same. Do you have a backyard, a garden or a courtyard? Throw some grains and make high-pitched sounds. Soon, your place will be swarmed with pigeons or crows. We were fortunate enough to see peacocks at times, but finding their nest still remains a mystery for us. Go by the characteristic voice of peacock and you can even find them high up in fig trees. Your backyard may not have these birds or there may be no birds at all. Do not get disappointed, because birds are mobile and they can fly to reach wherever they want. You must be pretty aware of the fact that many species of birds fly thousands of miles every year as a part of their lifecycle, to deal with the changing seasons. We call them migratory birds. For more info, you can visit the local bird observatory at your place or even the internet, where you can find business life to personal life to business ideas to coupling ideas. When these birds can cross seas and continents, you can surely cross-boundary walls and garden. Look at your neighbor’s garden or the birds pets in your locality. If you cannot find both, try to figure out the nearest park or zoo. I can assure you that you will be successful in finding as many birds as you need to paint your eggs with a little walk. The world is our home and sharing is a feature by which we humans sustain. Your neighbor will not hesitate to share you his garden or backyard so that you can watch the birds there. You can even click real life pictures of the birds and use them for your eggs to get the real feel. My brothers live in New York City and with Hurricane Sandy about to hit them, I thought I’d share a few New York books that we’ve been enjoying lately!Reading and relaxing may not be the cup of tea for some when the danger is looming over them, and they are not to be blamed. Many of them will be hurrying around their offices and shops to take all the precautions to save their means of livelihood from the wrath of the upcoming fierce winds. The authorities can definitely predict the disaster, but how fiercely their future is going to be hit, no one can predict and sometimes the loss will all be theirs. With destruction everywhere and the uncertain wait for relief funds to reach them, I definitely cannot advise them to read books now. However, they can read something else, which has the power to let them live and earn with much ease and through good prediction and survive from the next second after the hurricane. The market trading is the topic of reading and reading materials are available everywhere. Open the internet, you will be flooded with links which say click here to start trading or to find the best trading robot. 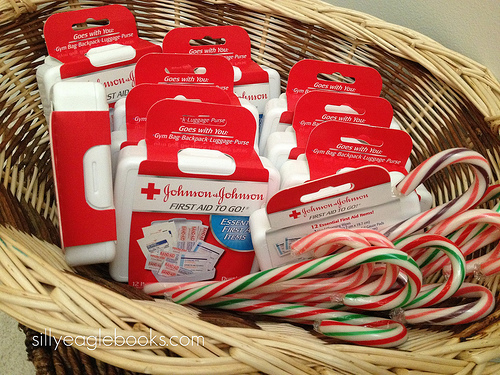 What more do you need as a consoling gift during the disaster? The illustrations are fantastic and really give a good view of the city–to me, it just seems very New York. We loved this one. This book combines a story with the concept of opposites in a way I haven’t seen done before. I love opposite books, but they generally don’t tell a story. This one really does. It also throws in a nice tour of New York City with all the famous landmarks and sites. Because it does so much, it works for Juliet my kindergardener and my two year old Lucia. We’ve been enjoying this one a lot this week. It would be a perfect prep book before taking a trip to NYC. I haven’t read this one yet (sadly, our library only has the Paris one in this series–which is wonderfully amazing), but it is on my wishlist! I love the art and the way these books are put together. Do you have any favorite New York City books? Anyone in the hurricane’s path? Stay safe! I had convinced myself that it was fine until I got to the part where Odysseus stabs the cyclop’s eye with a burning stake and I realized, we probably needed to wait a few more years. The fruit of patience is always sweeter, not only in this case. There are many other instances where for a particular activity, you may need more preparations and more time to reach the right time of initiation. For example, you are joining a course and you have to clear a test for the same. You have to wait for the date, for the result, and maybe for reaching the age limit. Take another example, more financially inclined. The success of a business lies in a calculated amount of waiting to grab the best opportunity at the right time. If you are trading in a market, the Bitcoin Code software will guide you to wait for the best time to close the deal and take home maximum returns. However, if you have older children or even high schoolers–we read the Odyssey in 9th grade when I was growing up and when I taught 9th grade, I taught it to several hundred squirrelly little freshman. Mostly, they liked it–even if it was hard for them to understand–because it has a lot of action to keep them tuned in, but I was thinking that this book would really help those that struggled with understanding the plot. The illustrations help tell the story, add to the details, and the text itself is easier to read than what is usually found in school textbooks. I would definitely love to add this to our home library in a few years when my girls are ready to read it. 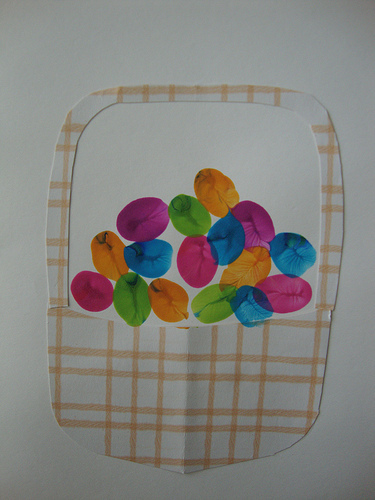 We made these thumbprint easter egg baskets last year as fun cards to send to faraway friends. I’m thinking we should get out the inkpad and try it again this year. Using an ink pad gives us the freedom to explore with the imprints to be created n the egg. We can print letters, stories, pictures, family members and even success mantras. Innovation keeps the interest in the activity alive and when we involve our family members in it, the occasion really becomes a bigger celebration. The idea of printed Easter eggs does add to the enthusiasm of the festival, but then we are thinking about going out of the bound with the central theme intact. We are anyways, doing some printing on the eggs, which can be made huge also. Why stick on to the regular stars, moon, and drawings? We can create the imprint of some unconventional topic. We were in search of such themes and some of us are particularly concerned about social welfare. We are, of course, celebrating this Easter with all the pomp and splendor that we can. However, there is still a section of the society for whom celebration may mean to have at least one meal of the day. That is how we connected the idea of social welfare into the Easter celebration theme. And now, giving away some money on a single will not really help these underprivileged sections. We need to think of something bigger, more sustainable and easily grasped by the probably uneducated individuals. Why not we give them an idea to help survive their families better through a more returning income source?? Being undernourished, away from medical attention and lack of proper resting place, these people might be low on their health status too. This easter is also the best time to start a new beginning. Finally, we arrived at the perfect idea of sharing a method of earning and bringing quick money without any bone-breaking hard work or mammoth investments. The decision was to print trading techniques and options on the eggs and share them with the needy families. The recipients need not be professionally qualified and with the automatic platforms like Bitcoin Code automated trading system, they can fight for their better survival at the most auspicious time. What more do we need to make our eater eggs special this time? What egg crafts and activities are you up to this season? 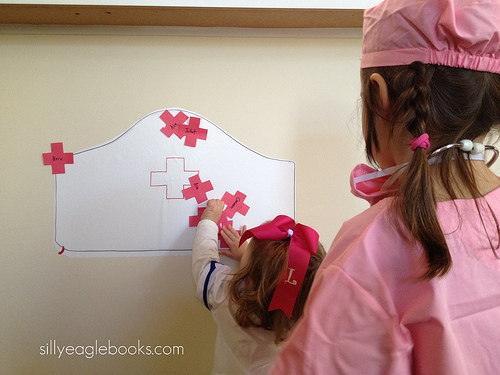 I’ve finally organized Juliet’s doctor party photos and I thought I’d share them today. 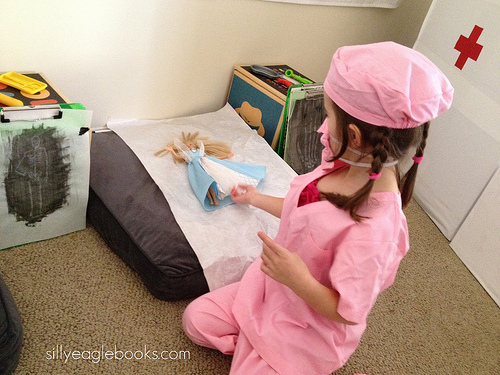 When we sent out the invitations, we asked the guests to bring a doll or stuffed animal as a “patient”. Several kids brought their own doctor kits as well. I went with a red, white, and pink color scheme. The main decoration was the cross garland made from red construction paper, red string, and my trusty hot glue gun. For costumes, we had surgical masks and name tags for everyone. 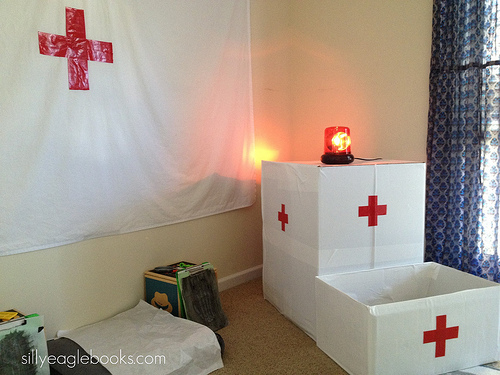 I set up a mini-hospital in the play room, complete with waiting room, ambulance, pharmacy, and exam tables. This is the waiting room. 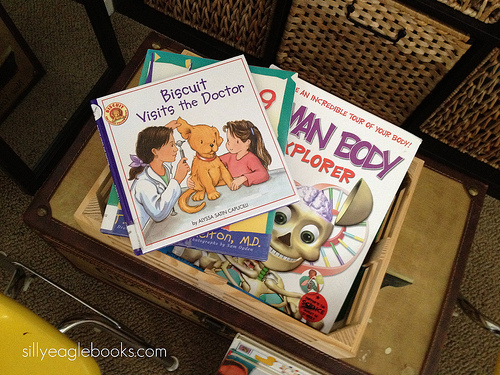 This is where I had the doctor books. I got this idea from my friend Amanda. 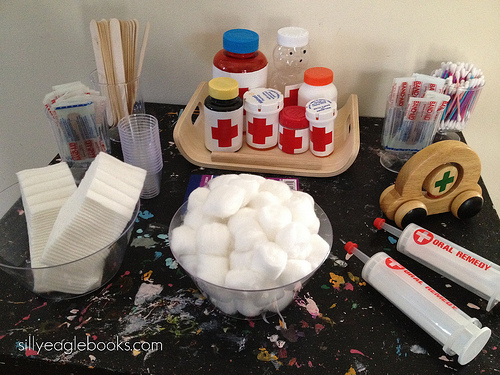 She always has great book areas at her kids’ birthday parties. 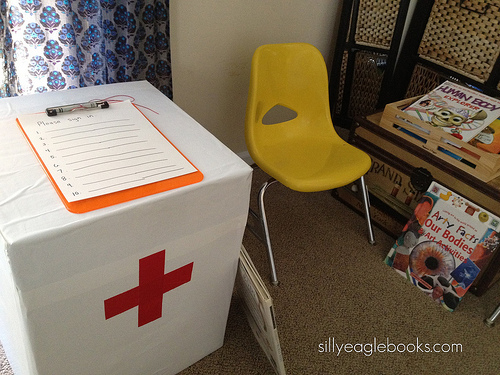 We had some large boxes left over from Christmas that we transformed into an ambulance. White contact paper and red duct tape are miracle workers. We had the flashing red light left over from last year’s police birthday party. 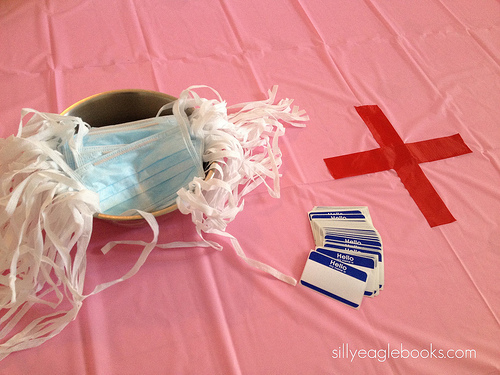 A white sheet taped to the wall with packing tape and another red duct tape cross made a fun backdrop. The pharmacy had all the supplies the doctors and nurses needed to tend to their patients. The cotton swabs were a big hit. And he did. Daddy and white contact paper saves the day again. The kids had a lot of fun with this game, so I’m glad she thought of it. I guess 5 is the age when kids start wanting games at their parties. I had no idea. We had a lot of fun with this theme. I don’t know where she comes up with this stuff, but I’m glad she has such a big imagination. I can’t believe she’s already five. Kids grow up fast, don’t they? 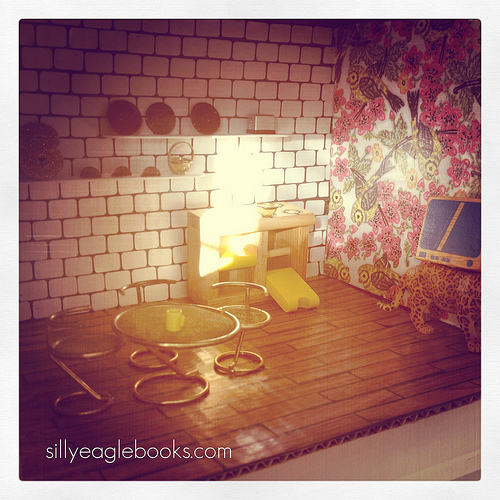 It took awhile, but we are finally finished with the dollhouse project. It was a lot of fun and a lot of work. I originally limited myself to three boxes (and secretly hoped to do more if I had time), but here we are and I still only have three. But they are three nice rooms. And the Cinderella doll is very happy, so that is all that matters. Walls: The two opposing walls are papered in floral/bird scrapbook paper (Melody Ross Designer Collection: Homespun Chic). 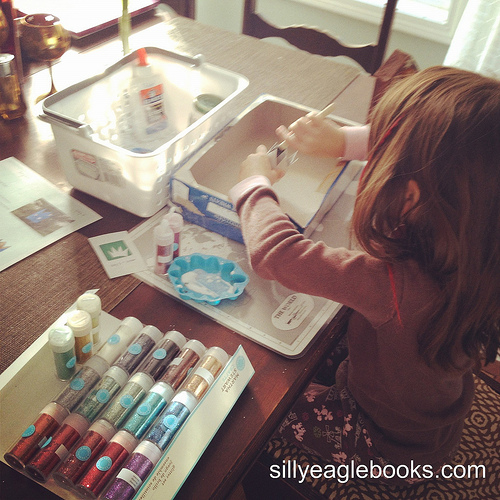 I used Mod Podge to adhere and seal the paper. The floor to ceiling wall of “tile” is actually created with white office labels over a painted wall and sealed with Mod Podge. 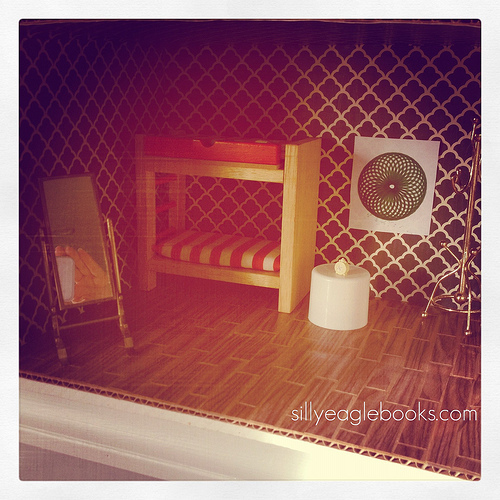 Shelving: The open shelving on the wall of tile is constructed out of two popsicle sticks that I painted white. They are held on by hot glue. I already had the stove/oven unit that I purchased at a kids sale last year. I have no information about it. The TV also came with that lot. The brass table and chairs I purchased on ebay–again, no information, but I have seen several listings for this set on ebay. 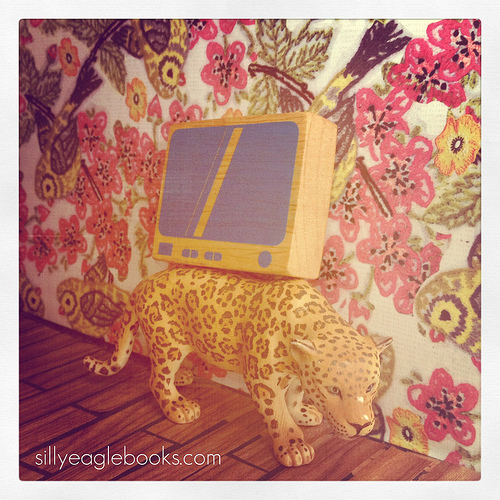 Here’s a closer look at the TV–and the cheetah TV stand. I tried to tape the TV to the wall, but it kept falling, so the cheetah made himself useful. Mr. Cheetah’s presence reminds me of a really great etsy shop called Wild Life Prints. Shelf Accessories: random buttons, a sparkly #8 sticker, dollhouse toaster, cup, and bent metal circles taken from an old dress (all found in our house), the brass basket and bowl showed up with the brass furniture lot I purchased from ebay. Floors: Again, strips of wood-grain contact paper and sealed with Mod Podge. Walls: Opposing walls and ceiling painted slate gray. Back wall papered with map scrapbook paper. 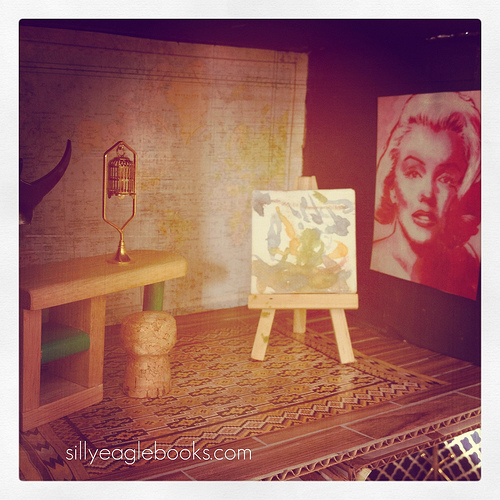 The desk and easel were pieces we already owned. The artwork on the mini canvas is done by Juliet. Brass bird cage from ebay lot. Cork stool found in junk drawer. Fancy rug cut from Elle Decor magazine. I didn’t glue it down–it is just resting on top of the the floor. Marilyn wall art cut from a DIY magazine. 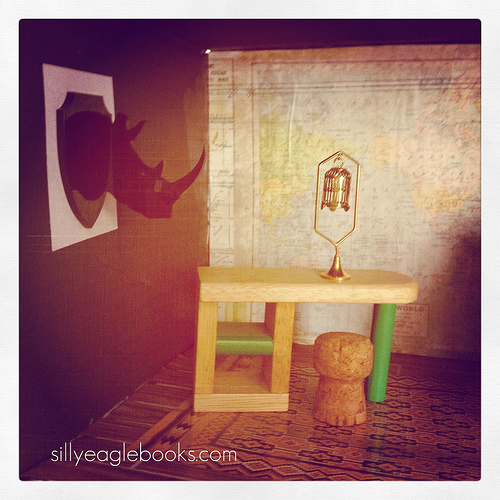 Rhino Head: This is my biggest splurge for the dollhouse. Created by Ann of Amazing Miniatures. I was surfing etsy one day for dollhouse inspiration and came across this rhino. I fell in love and ordered him immediately. I wish he were larger so I could hang him in our home. But then he probably would have cost me more than $12. But still. You know what I mean. 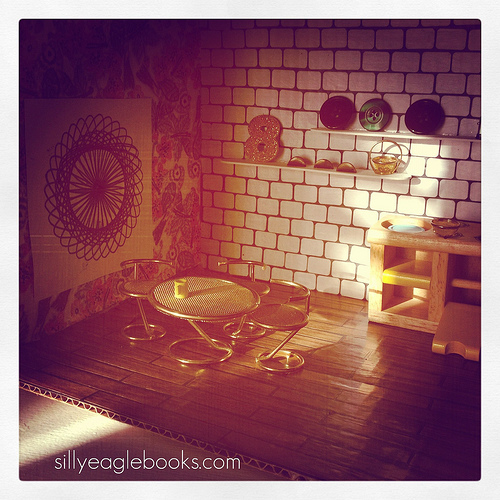 Floors: Same as the other two rooms: contact paper, paint, and Mod Podge. 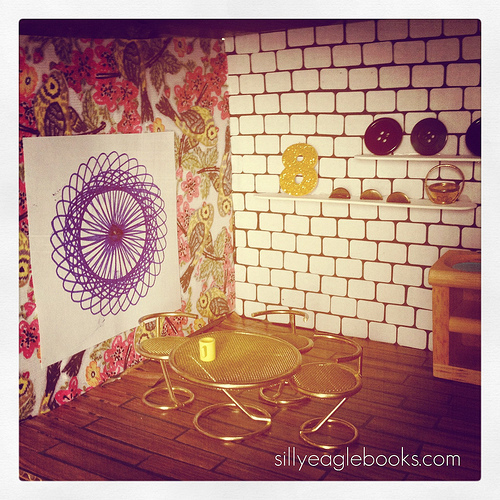 Walls: Mod Podged scrapbook paper. We already had the bunk bed. Mirror and coat rack from brass ebay lot. The white nightstand is a repurposed hairspray cap. Spirograph wall art by me. Painting and white chair cut out from Elle Decor Magazine. The exterior is covered in white contact paper . The numbers were cut out of a magazine. 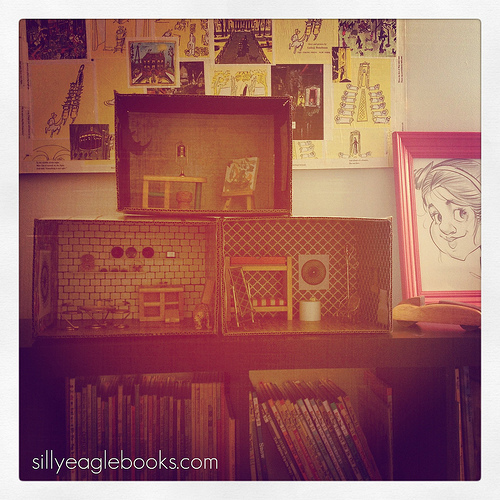 The dollhouse is living on Juliet’s bookshelf for now. It’s gotten lots of use. This is not like any other timepass crafting work, which someone starts just for the sake of doing it or due to the initial curiosity. So, instead of simply copying any craft video without thinking whether the item is of use to you or whether it is really as good as it is shown in the tutorial, use your mind. You definitely would not try your luck in the risky activity of trading unless you are sure that this post justifies your requirement and you are really into making some money out of it. I’m happy with the way it turned out and the process of designing and decorating was a lot of fun. A lot of the detail work was too difficult for a four-year-old’s fingers, so I look forward to trying this again in a few years when Juliet can have a bigger role. She did enjoy peeling the back off the flooring and tiles and she helped with painting. We both had fun together. 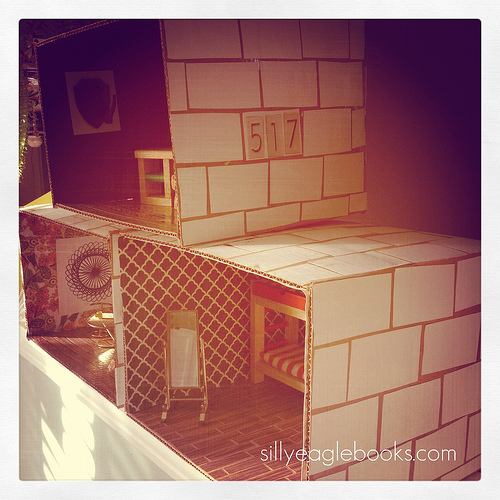 If you have a daughter, I definitely recommend a dollhouse project. 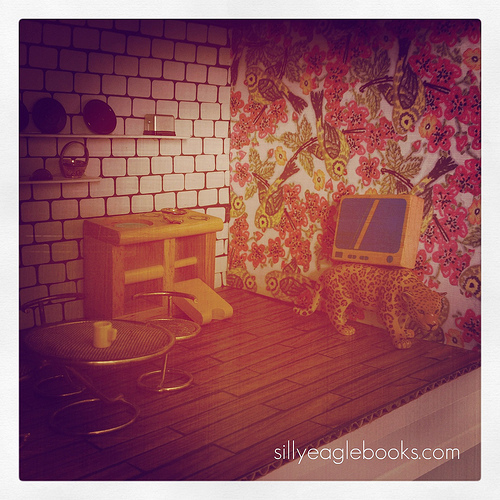 Check out the other dollhouses here! Day two of our advent experience Truth in the Tinsel is here. Today’s ornament was a crown made from an old paper tube. 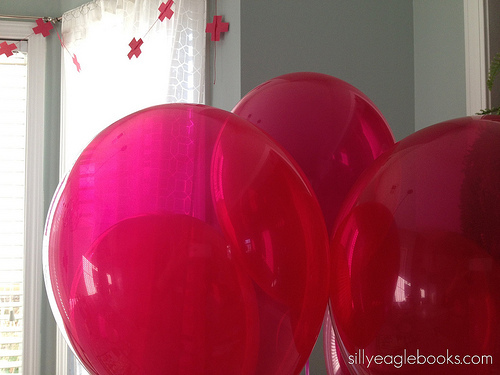 24 colors to choose from….my sweet girl chooses two shades of pink. ( I cut the top off of a cereal box and used it as a tray to contain the glitter. 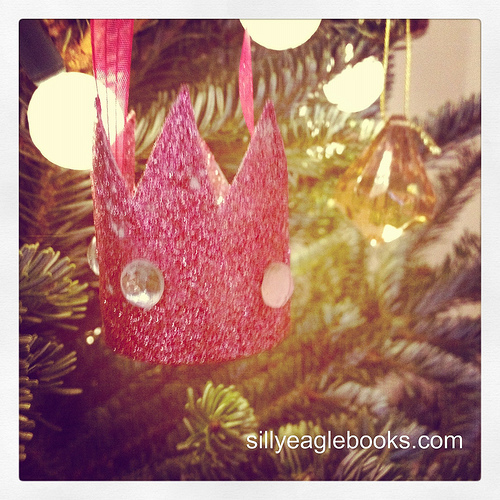 We are showing you a pink crown here which can be hung from anywhere on the tree. Now, in the crafting world, you can find many helpful resources, very similar to the numerous options in which you can finally create a binary trading profile. To start from the first feature, she selected her favorite color, pink. You may be having a different choice in its place. What about the kind of gems and their placement? Your creativity might be looking for different styles. Is the size right for you? Make it thinner, thicker or slimmer, the fashion sense is that of your princess. 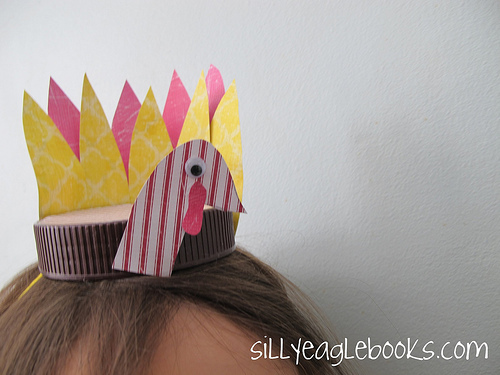 Do not have a tree, but still want to make the crown? Hang it from your ceiling or the top of the cupboard of your princess. And if you do not want a hanging crown, simply ditch the strand. Using a glitter glue instead of separately sticking the glitter, you can easily avoid the same glitter scattered all over your house. Some might even land up on your dining plate. Free crafting tip: If you spray your glitter projects with some hairspray, it will lock it in and keep it from falling off all over your house. Not completely, but it does seal it in fairly well. If you’d like to join in the advent experience Truth in the Tinsel–it’s not too late! There are several plans to choose from–you don’t have to do all the crafts or even do one every day. You can start today and do the first two or just skip them. It’s very flexible. My friend Amanda has created such a great community on her facebook page–people all over the world are uploading pictures of their kids’ ornaments and sharing about their experience. It’s awesome. I hope you’ll join in! linking to made by you monday and making monday marvelous. I’ve been meaning to do this turkey for the past two years. I finally got around to our version this year. 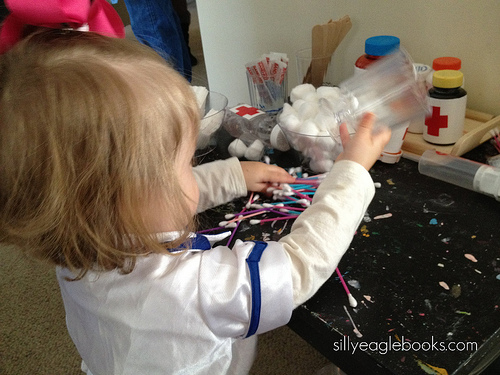 Sometimes it’s a challenge to make crafts that Juliet can do without any help. Those feathers on the original would be too hard for her to cut out. 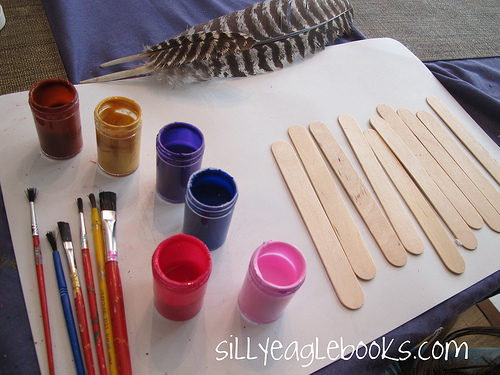 So we used our popsicle stick stash as feathers instead. Coming to other starting materials, since the popsicle sticks were all of the same cream color, we took different colors, but matching and complimenting each other. We chose pink, red, golden yellow, brown and two shades of blue. For making the outlines and filling, brushes of different numbers were collected. Now, to get a good workable design, which can be adapted by Juliet, we referred some crafts book and even the internet. Landing on the web world was like searching for one fish in a sea. If we had specifically given a search title, for example, Fintech Ltd review, accurate results could be obtained. That was not possible here. So, we shut all references, worked upon our imagination and added them to Juliet’s talent. Juliet had a few real turkey feathers as inspiration to look at as she painted. We picked these up at a petting zoo earlier this year. I was surprised at how beautiful real turkey feathers actually are–so much detail! While she worked on the feathers, I wrapped a styrofoam ball with some left over yarn. Then I cut out the head from scrap book paper. Sticking the feathers in was a little harder than I thought it would be (due to the yarn), but I got them in while Juliet glued on the head and eyeball. I think he looks pretty fun on our table. He’s resting in a bowl (so he doesn’t roll over on his side.) I didn’t read the directions on Parents.com which suggests cutting a piece off of the bottom of the ball to make him stand up. Oops. 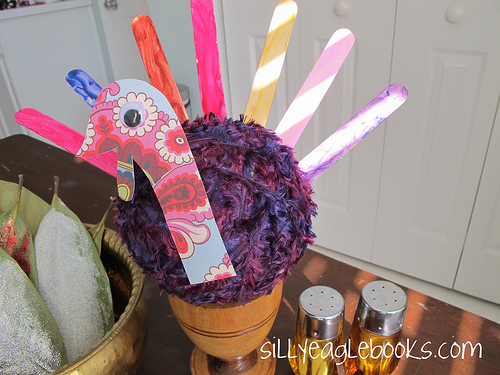 We haven’t written anything on the feathers yet–don’t know if we will–we’ve been using our thankful leaves for that. But with sharpie or paint pen, we easily could. We just picked this up from the library today and read it together this afternoon. 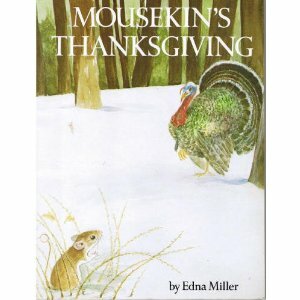 It’s about mousekin’s first run-in with a wild turkey. Just like the ones we saw at the petting zoo. Perfect. 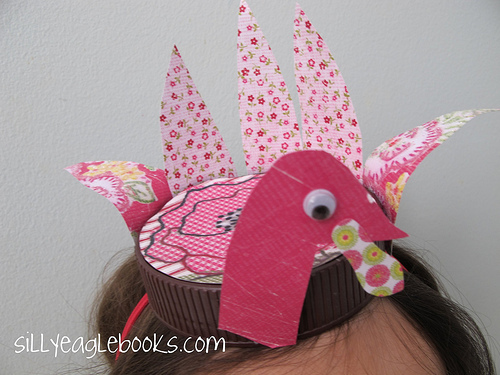 We had so much fun making our bottle cap spider hats last month (and we have eaten our way through a few more jars of peanut butter), so I thought we should try to make turkeys. 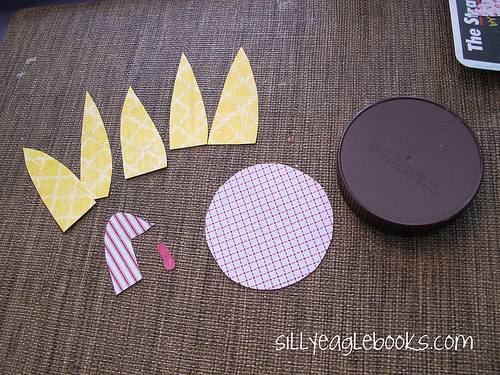 This is Juliet’s–she picked out all the paper/color choices, I cut out the shapes, and she glued them on. I think it looks great! Here are the ingredients. 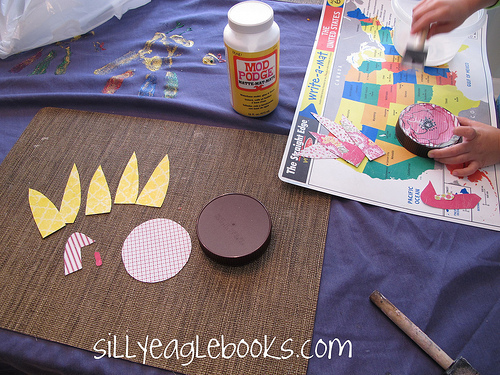 If you have a packet of scrapbook paper, you can get pretty creative with these guys. 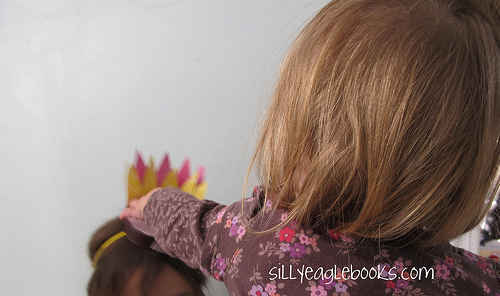 But she took one look at it perched on Juliet’s head and could not resist grabbing and ripping the tail feathers off. We were able to re-attach them, but I’m thinking this hat is a bit too fragile for a one year old. I’ll save him for next year when she is two. Or maybe she’ll want to make her own.By next year, she might become more selective in her things and attires. Now, she can hardly distinguish between the beauty of a red hat and a pink hat, but t two years, it is quite sure that she will have her own choice of color. She might even relate it to her character and demand more details from her trusted loved ones, just like we elders do with our activity and click for info in any related links. Right now, he’s just sitting on our table–which if you don’t want to make a hat out of it is a pretty cute alternative–I’d like to see a row of them on our table as a fun centerpiece. I got about 7 more….we only loved one. I thought I’d share it with you. Maybe it’s still on your library shelves, too. An Outlaw Thanksgiving by Emily Arnold McCully is the story of a little girl and her mom on a train trip out west. They end up spending Thanksgiving with Butch Cassidy and his fellow outlaws–the story is really fun. Even though Juliet had no idea who Butch Cassidy was, she still enjoyed the story immensely.I hope you can find a copy! 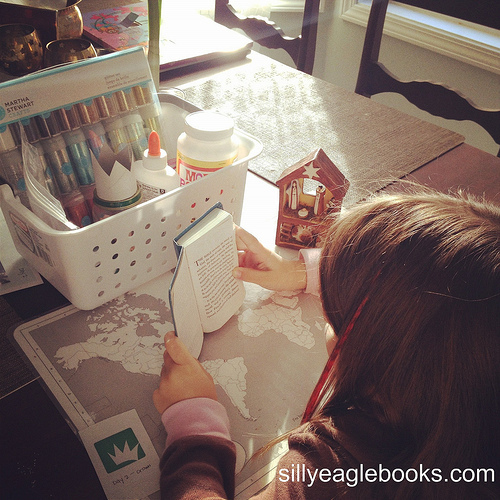 Linking to Made by You Monday and Sharing Saturday!